One aspect I always try to live by is that simple is better. If you have to cover up your food with greasy caramelized onions or more garlic than is necessary so that no one eating it realizes how bad it it, then you shouldn’t be in the restaurant business. Unfortunately, Vida Cantina in the St. Louis Galleria did not get my memo. Let’s start from the beginning my dear friends cause this little doggy has got some serious bite this morning. The Queso Fundido was actually floating in a layer of grease. Onions are one thing but to cover the entire dish in limp, over caramelized onions is something unforgivable. Just pour some melted crisco down my throat instead. The chips we unsalted and bland. I’ve had better out of a bag at a gas station vending machine. The salsa looked promising but as I now know, looks at Vida Cantina can be very very deceiving. The only thing you could taste in the salsa was the garlic. No tomato, no cilantro, no peppers. That was quickly pushed to the side of the table. What I should have done is to have pushed it on the floor. The meal came and once again it looked quite good. My little paws were anxious to dig into the green chile pork enchiladas, carne asada, and chicken tacos. One bit of the chicken taco was all I needed to know that not one more bit of that taco was going to cross these lips. The chicken as everything else had no flavor, so they once again covered it up with greasy overcooked onions, and the strange pale orange sauce that leaked out between the corn tortilla. The carne asada was no better. Tasteless meat being disguised as edible with overcooked things. I am still trying to get the old, grease smell off my paws. The only reason I am giving this place two paws instead of one is the fact that they made a halfway decent margarita. I guess if you drink enough ahead of time, you won’t mind eating the slop they serve. Don’t waste your time or money. There are plenty of other Mexican Restaurants (I use the word Mexican carefully here) in the St. Louis area that deserve your business. 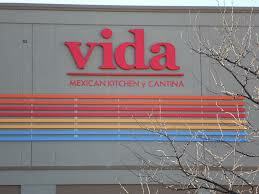 Vida Cantina does not. With love from my dog bowl to yours……Happy eating! Sounds like Shata ought to write for Out in Print. It takes a lot less time to eat something and know if it’s any good, than it does to read a novel.